This camp is designed for the first time camper. 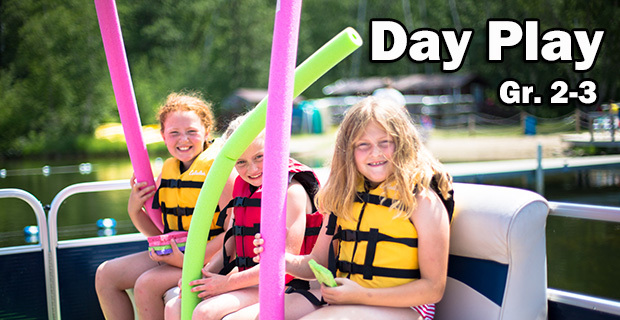 Day Play campers will enjoy basic camp activities: worship, swimming, campfire, Bible study, games & more! Plus, Day Play campers get to have their first experience staying in a cabin for one night with new friends while getting to know a counselor who’s excited to guide the cabin mates in their first camp experience. Day Play is a GREAT way to get a first taste of what Camp Metigoshe is all about! Day Play I,II and III begin at 5:00 pm on Sunday and conclude at 7:30 pm on Monday. Day Play IV begins at 11:00 am on Thursday and concludes at 2:00 pm on Friday, with the staff musical beginning at that time.